Types of Art: Lulua masks are extremely rare and were probably used during circumcision and funeral ceremonies. They displayed enlarged eyes and complex scarification patterns on their cheeks. Lulua carvers are known mostly for the ancestor figures they produced. 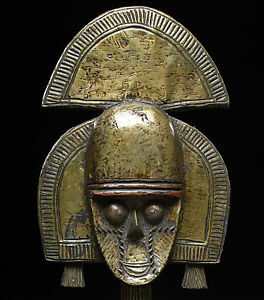 The figures carry weapons and shields and represent the ideal warrior, known as the Mukalenga Wa Nkashaama. They also personify the head of the leopard society who is considered to be an intermediary between the living and the dead - between natural and spiritual forces.